The GotoWebinar Integration is one of the most popular Helpers we have and it is also one of the most sophisticated. Please pay careful attention to the video above as we cover quite a bit of stuff in it and it's a bit longer than most. ​Also, don't get overwhelmed by all of the features, most of them are optional and most people only use a small fraction of them. The purpose of the sophistication is not to overwhelm, but just to provide you with a lot of options that you may need (depending upon your situation). But by no means does it mean that you have to use them all. Most all other GotoWebinar Integrations require you to use tags for all of your segmentation. We allow you to choose between tags or API goals. Many advanced marketers prefer API goals because they don't clutter up your system with unnecessary tags. This is a nice little gem that we offer that not enough people take advantage of. We give you the option to embed calendar links into your emails so that you can add those nice little calendar images and link them to these links, giving your users a quick and easy way to save your webinar right to their calendar of choice. This is a perfect example of how we customize our Helpers to YOUR needs. Several clients expressed the need to unregister contacts who had opted out of Infusionsoft so that they didn't keep getting webinar notifications from GotoWebinar as well. So we've added that feature to the integration for you. ​There are several standard ways to segment your registrants, like those that attended versus those that didn't. But we also give you the ability to create your own segments based upon numerous criteria. So maybe you want to create a custom segment based upon minutes attended, or questions asked, or any of several other criteria. We ​let you do that and give you powerful options so that you can create your own custom segments. ​Copy Link for Infusionsoft - This is the standard Http Post snippet URL you use when creating the integration inside of the Infusionsoft campaign builder. Unregister Contact - This link allows you go copy a link that you can use in an Http Post snipper to unregister someone from the GotoWebinar emails. You likely would only want to do this if they had opted out of Infusionsoft or changed their mind and no longer wanted to attend the webinar. Calendar Links - This button allows you to copy the URLS used for iCal, Google and Outlook calendar links. NOTE: This will be disabled if you have not elected to save the link to a custom field in the setup. What's the Best Practice for Recurring Webinars? Welcome to MyFusion Helper. This video is going to cover the training for how to set up GotoWebinar integration and configure our GotoWebinar helper. Now, this is absolutely one of my favorite helpers in the system. It is very sophisticated and allows a ton of different options. So, this video may take a little longer than the others as there is lots of stuff to cover in how it works. Don’t be scared away though because you can set it up very simply or you can set up with more robust configuration. It’s really up to you and I don’t want you to be intimidated by this because it is quite simple to set it up in a basic manner as well. So, the first thing we’re going to do is do a live demo of how to set it up. Then, I’ll show you how to integrate it with GotoWebinar as well, but that’s really quite trivial. I’ll also show you how to integrate it with InfusionSoft, which again is quite trivial. Then, we’ll talk about some kind of strategies and best implementations for setting up these sophisticated webinars. All right. So, let’s dive into the demo and go from there. Okay. So, let’s dive into the app and show you how to set things up with GotoWebinar. Now, I’ve purposely created a brand new account here. So, you’ll see there’s not a single helper in it. This was a brand spanking new account. I did this because I want to show you the configuration with GotoWebinar as well so that you can see the whole process. So, if I got in here and I start to add a GotoWebinar, it’s going to come to this screen and say first you’ve got to allow MyFusionHelper to access GotoWebinar, right? So, it’s got to be linked up with the API first. So, when you do that, you’ll click here and it’ll allow you to log in to your GotoWebinar, very simple. Just log in and then it’s going to perhaps ask you validate that you have access. So, GotoWebinar is going to say just confirm. Are you sure you want to allow access? You’ve got to say yes. So, you click on allow. That will then create the API connection. That’s how simple it is. You just log in and click allow and from now on, when you pull up here, it’ll have your webinar--will be showing up right in here inside of the interface. So, this is very simple to set up and you only have to go through that set up one time. Okay? So, once the API is established, we save that connection and then allow you to set up your webinars whenever you need to from that point forward. So, let’s go ahead and give this a name and let’s say this is our “Mastermind Webinar” and we then go ahead and start walking through these options. Now, there’s going to be a lot of options here. I don’t want you to be overwhelmed. The purpose here is not to try to impress you with all the things that we’ve got. Okay? I want to walk through them all because I really want you to think of this a menu or a smorgasbord of everything that you can potentially do. It doesn’t mean that you should do all of this. Every business model is going to be different and going to need some of these features and others may not need some of these features. So, that’s totally fine, but I want you to see what’s available and then you can kind of think of it as a smorgasbord and eat all you want. So, pick what’s good for you and ignore the ones that you don’t need. Okay? So, the first thing that we need to do is select a webinar. So, I’ll just set it up for the mastermind webinar. Then, what we’re going to do is apply some different tags. So, you can have tags for registrants, tags for attendees and tags for non-attendees. Now, why do you need to do this? The reason for doing these different tags is to create different segments of your audience so that later we can market to people that attended separately from people that didn’t attend. Right? So, the people that attended, we can throw them into a marketing sequence to see if they--we will also know whether they purchased or not, right? If they didn’t purchase, but attended, then we want to throw them right into a marketing sequence to sell them the webinar item. Right? Now, if it’s a non-attendee, then we need to get them to watch. Perhaps, we’re going to do an encore and we drive them to the encore presentation. Perhaps we’re going to send them to a replay. Those types of things. So, we want to treat these segments of people differently and the way we do that is by segmenting it with a tag in the first place. So, let me see if we have a--I probably don’t have tags set up for this so I’m just going to make some bogus tags here. So, don’t worry about that. I just want to configure just so you can kind of see. But, you would obviously have tags separated for registration, attended, non-attended. Okay. Now, here’s some other sets of information that you may or may not want to use. Depending on how you’re doing your integration with your emails, you may want to send out the emails directly from infusion soft. If that’s the case, you’re going to need to know what the title of the webinar was, what the join link was, and what the time of the webinar is so that you can merge those fields into your emails. If you want to do that, then you can save these into custom fields. Okay? So, I’m not going to do that at this time, but you would need three additional custom fields to save that information. Then, we can directly merge that information right into your emails and custom tailor them. So, we can say, “Hey. Don’t forget, we’ve got the webinar coming up. It’s going to be on the 10th. Here’s your join link.” Or, whatever. Okay? Now, if that’s all you want to do. That’s fine. You can go ahead and create the helper here, but I’m going to show you a bunch of additional options as well. There’s a couple more levels of additional options. So, just know that you don’t have to do any of this stuff. It’s all optional. Okay? So, just use what makes sense for you. But, I want to show you the power of what’s under the hood. So, when we show additional options, we’ve got some other things that we can do. Now, all of these allow us to create additional segments and have additional data about the people on the webinar. We deal with a lot of different industries and business types and sectors in our clients and masterminds and they have various needs. Some of them have mandatory webinars for franchised stuff that they have to attend. So, we need to have very specific tracking data. Others are doing high volume webinars where they’re putting several hundred people on the webinar and they need to inch out just every single bit of profit out of these webinars because they’re spending a lot of money to put hundreds and hundreds of people on the webinar. So, they really need robust segmenting. Others are just using webinars in a very kind of trivial way and it’s into really important to master this, but they just want to set some of the basic tags. So, use this how it makes sense for you. But, we can tag late arrivals. So, somebody that arrives late, we can tag them separately. We can also save the join time and the exit time to an InfusionSoft custom field. So, we’ll know exactly when they came into the webinar and exactly when they left. We can also store the minutes attended so we’ll know how long they were on the webinar. Then, this is a really critical one. We can store the question and comments into an InfusionSoft custom field as well. Now, all of those things allow us to do different segments. So, if we had a mandatory webinar for a franchising company, for example, and the person didn’t attend the full webinar, then we would know and we could send them a follow up and say, you know, “Per your franchisee agreement, we need to have a mandatory compliance with this and it looks like you missed the last half of the webinar. Here’s a reply link. You can watch it here.” In that replay link, we can send him to a page that we use the video trigger so that we can, again, monitor that they actually watch the video or not, watch the reply. So, there’s some very sophisticated things we can do here. Minutes attended could be used for that. The questions are very powerful because now you’ll have the data of who asked what question and when you are following up, depending again on your business model, if you’re selling an information product and you’re probably not following up and it’s just a buy-on webinar or that’s it, that’s fine. But, if you’re selling a high-end coaching program that’s a 5k or 10k or 25 or 50k program then you likely have small numbers of people attending and you likely follow up with every single one of them. If that’s the case, when you get on the phone with them, you want to be armed with all of that information and knowing exactly what questions they asked and be able to pull that up inside of InfusionSoft is critical. Now, here is something I really, really like, and these are things that nobody else in the industry is doing with their GotoWebinar integrations and I really like this stuff. That’s why we really went to the nth degree to make sure to put all of this stuff in here. You can add a summary note right into the InfusionSoft record of all of this data. So, maybe you don’t want to waste a whole bunch of custom fields and maybe it’s not really that relevant to use all this data inside of custom fields, you’re not necessarily segmenting off of it or automating off of that data, but you don’t want to lose the data either, right? So, what you can do is just save it all into a note with a summary if you’d like and that’ll create a nice natural language note with all of the data in there so that you can see it. Now, again, this is kind of the next level. You see? We’ve kind of drilled down a couple of different levels of segmentation. This last one is just one further degree of advanced segmentation. So, we can go ahead and turn that on and it opens up another set of options. Now, this is really the holy grail when it comes to segmentation. We allow you to take any of these different areas and then apply a criterion to it, which you can specify, and then allow that to either trigger a tag or trigger or an API goal which is our preference unless you actually need the tagging to be there and preserved. Now, another thing that you can do here is you can add multiple criteria. I just want to show you this. You can add and remove the criteria as you need here on the side. So, let’s just talk about this here for a minute. You could look at this and say, you know what? I want to look at the number of words in the questions that they asked and if it’s greater than, let’s say, 50--again, you can put this at any threshold you want--then that means that I’ve got a high engaged contact and I want to apply the engaged lead sales follow up API goal. Now, that is a really specific segmentation that you are able to dynamically create, okay? You can do this based on anything. You can even do it based on their surveys responded or polls answered or their attendance. Some really neat stuff. But, the ones that I used the most are this words in question. I think that this is one of the best ways to know your super engaged people on the webinar. The ones that are asking a lot of questions and it doesn’t mean you’re not going to follow up with everybody, but look. If you’re selling a 10k package and you’ve got to talk to those potential prospects because it’s not something they’re likely to buy without a sales call, you want to know who are your highest engaged, your most probable buyers so that I can talk to them first in the process because we all know that your best sales are going to come immediately after the webinar or within the first 48 hours. After that, if you follow up with somebody a week later, it doesn’t mean that you can’t still close them, but it’s going to be much harder when everything is kind of the dust has settled and they’re no longer in that emotional buying mode from just having seen your webinar. So, being able to segment out those highly engaged people and getting to them the quickest is a great way of doing it and, you know, using the words in question or characters and questions and segmenting off of that is a great way to do it. Okay, at this point, you would just go ahead and create the helper. We’ve set everything up the way we want it and you know, I didn’t do a lot of the segmentation tags here, but you can easily see how to do that. Just select the custom fields or select the tags that you want to apply. It’s very straight forward and very simple. Then, I can create the helper. Now, once the helper is created, it’s going to go out and after the webinar is complete, it’s going to pull all of this data in and fire off the different tagging and segments for you automatically. So, now, the only thing left to do is copy a link to InfusionSoft. The reason you want to do this is you want to register somebody in InfusionSoft for the webinar with GotoWebinar. So, let’s just say we’re in here and we’ve got--let me just pull up a test one--and we’ve got a web form where they registered. Okay? This will be for the register them for the webinar. Okay? So, they submitted a web form, so know we want to associate that contact automatically with Gotowebinar and register them there as well. So, the way we do that is we come in here and we add this http post and we’ll say MyFusionHelper, GotoWebinar and then we’ll come in here and we’ll paste in that URL and this will add this contact into the webinar registration. Once that is done, if you had our goals, so let’s say later we have our goals here and we’ve got a tag goal for attended and then we might have another one down here and here for didn’t attend webinar. So, we’ve got a couple of different options here. Then, we can do this from our webinar. So, now what’s going to happen and what we could market to these people individually and separately based on what their threshold of engagement was. Did they attend the webinar? Did they not attend the webinar? You might have a segment that you call “left early” that you determine based on the number of minutes that they attended and create an API goal or tag for left early and treat them with a third segment. All of this is up to you. So, what’s going to happen is the contact’s going to come in. They’re going to register. The API here is going to register them for the actual webinar. Then, when the webinar is complete, it will apply these segmentation tags and it’ll go on to the next steps. So, it’ll sit here and wait until that’s done and they’ll move on in your automation. So, that’s how you would implement it. 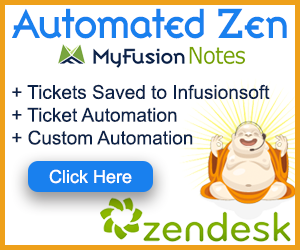 It’s very straightforward to implement it inside of InfusionSoft. The real trick is really taking the time to go through the actual configuration and determine what things you want to segment based on what options you want to use, what things you want to tag. That is really going to be where the devil is in the details of making sure you’ve got it set up the right way. Now, my recommendation with this is that you start simple. Okay? With anything, if you try to get overly complex in the beginning, then it just makes it harder to learn the system. So, as we talk about some examples here of what to do, the first point that I really want to emphasize with you is start simple. Add some basic segmentation and then expand that over time to get more and more refined. The beauty of webinars is the live engagement and being able to talk to people directly, answer their questions, and that real time engagement. What we want to do is extend that. The show up rates are getting lower and lower these days for webinars. It’s not as great as it used to be a year or two ago. So, what’s important today is that you have a highly efficient and effective follow up system with your webinars. Not only after and during the webinar, but actually before the webinar as well. So, one of the things that you may want to do--and this is a special little tip for you, is that pre-webinar, you should use something like the date calc to determine the number of days before the webinar that somebody is registering. So, let’s say you start your ads five or seven days out and you have several emails that go out to engage them. Maybe you’ve got a couple of case studies or free PDFs or other little short videos that you show them prior to the live webinar to get them engaged. Well, using the date calc helper, we can determine the number of days until the webinar and then based on the number of days we have left, we can drop them into different pre-webinar warm up sequences. So, if they register seven days out, they get all of the emails. But, if they register only three days out, then there’s still some very important data and we’re not going to be able to just skip certain days. We probably want to have a different sequence that combines some of the information into just two or three emails instead. Likewise, if they register the day of the webinar, we still probably want to give them some good detail about the webinar that’s coming up and maybe send them to a case study because they’ve got a few hours before the webinar starts and we still want to do that. So, being able to intelligently and logically create customized paths for people and not only after the webinar, but before it is what’s going to allow you to get the most bang for your buck out of every single one of those people that you’re putting on the webinar. You want to engage them. You want to encourage high show up rates and then you want to get the most conversions you possibly can out of using all of these advanced segmentations and logic that we’ve put into this go-to webinar integration so that you can enhance your ROI on your webinars. That’s what it’s really all about. I hope you got a lot of great take-aways from this presentation. As always, reach out on the help desk, at help@myfusionsolutions.com, if you need any help.